On 4 April 2019, BBC Scotland broadcast a 10-minute report on our #MyFutureBack campaign at the start of news show "The Nine". The next day, BBC News published a story online. 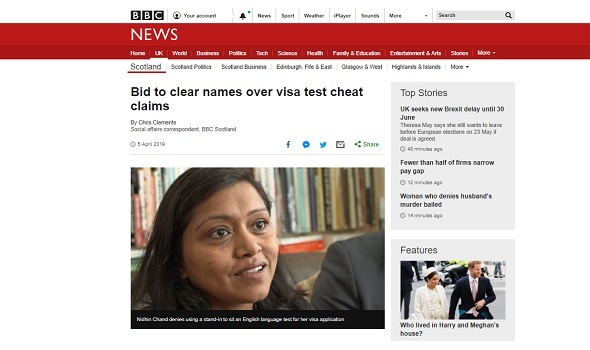 For the report, the BBC spoke to two students who were wrongly accused of cheating by the Home Office in 2014. Nidhin and Mosiur spoke about the devastating impact of the allegation on their lives. "I have been crying every day," said Nidhin. "It is painful when someone calls you a fraud... I haven't deceived anyone." Mosiur spoke about how he has been prevented from starting his professional career. "We could not move forward with our lives. We are stuck in some sort of open jail in the UK."